BAKERSFIELD, Calif. — The Kern County Sheriff's Office has a Crime Prevention Unit and one of their tasks is educating both children and parents on internet safety. The unit travels to schools and groups giving presentations to students on how to stay safe and parents on how to keep their kids safe. Elvie Martinez with the Crime Prevention Unit said they have five main topics they teach the parents, including risky sites to avoid, online predators, sharing too much information, sexting and cyberbullying. According to Martinez, cyberbullying is one of the more important topics and parents should take it seriously. They should be aware of their children and pay attention to if they shut down or pay too close attention to their phone. "What they would say in person they go home and say it even more. it becomes even more exaggerated," said Martinez. Also, sexting is a lot more common than parents might think. Martinez said it can start as young as fifth grade and is illegal for anyone younger than 18. She said it's important to talk to your children about the severity of sexting and let them know exactly what it is and why it is inappropriate and potentially dangerous. 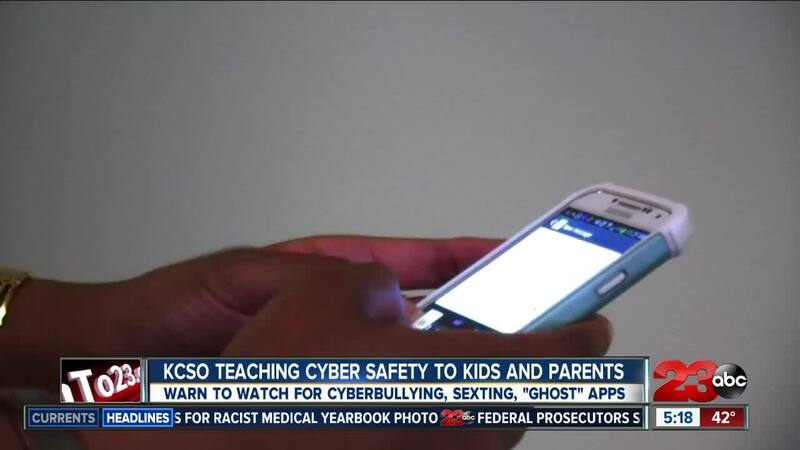 Parents should also be on the lookout for "ghost" apps. These applications are disguised as innocent apps, like a calculator, but are actually tools to hide messages, pictures and more. To check these, parents should actually open every single app on a phone rather than just looking at the home screen. "If your kid has two calculators, check one out because it's probably a vault," said Martinez. In addition, everyone of any age needs to know that location services settings on phones can compromise your personal information. Predators can look at a photo and figure out exactly where and when it was taken, which can create an unsafe situation. Martinez said to fix this, users can go into settings and turn off location services for your camera. For parents to keep an eye on their kid's use of cell phones, there are applications that can monitor how much data is used and track text messages. There are also apps that can lock a phone if a child is not responding to their parents. "You know if you're trying to get them and they blow you off and they're not answering your phone call, you can block them. They can't call, they can't text, they can't do anything until they contact you," said Martinez. Martinez said the most important thing for all of these topics is communication. Parents need to have an open dialogue with their kids about the dangers of internet safety and create an environment where conversations can be had about how to use social media in a safe way. "Treat it like a privilege and let the kids know about being smart about using their smart phone," said Martinez. To schedule a visit from the KCSO Crime Prevention Unit to a school or group, you can call 661-391-7559.